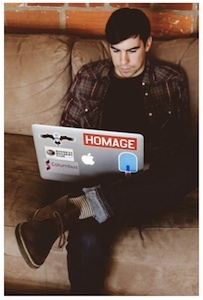 Don't Be Scared of git rebase | I care, I share, I'm Nathan LeClaire. Developers like to pretend that we’re analytical and make decisions based purely on logic but the truth is that, like most people, we’re creatures of emotion and habit first and foremost. We get superstitious sometimes, and in the face of the brain-crushing complexity of modern computing, who wouldn’t? One fear I’ve noticed is of git (in general) and in particular of git rebase. Indeed, previously I worked on a team where the mere mention of a rebase to the wrong team member could evoke howls of anxiety and protest. Feel free to share your own rebase experiences in the comments. Rebasing, like most of git, should be learned and applied to be useful - not feared or misunderstood - so if you’ve been bitten by rebase in the past, or are simply curious about how it can be used, hopefully I can persuade you here of its utility. From the man page: “git rebase: Forward-port local commits to the updated upstream head”. LOLWUT? git rebase in its simplest form is a command which will “port” another branch (Branch A) into the branch where you are currently working (Branch B), by applying all of your unique commits from Branch B on top of Branch A and replacing Branch B with this revised version. That way, you can “catch up” to other branches by re-writing git history in your local git. For instance, you might rebase on top of master to catch your branch up to the current state of the world in your feature branch. In a rebase, Branch A is considered “ours” (git checkout --ours can be used in a conflict to get this version) because it’s where we started working from git’s perspective, and Branch B is considered “theirs” (git checkout --theirs also exists) because from git’s perspective those are the “foreign” commits to port. git rebase likely has an opposite idea than you do about which branch is “ours” vs. “theirs”. In a rebase, you usually are working on a feature branch or locally unique version which you look at and think is “ours”, and which you want to port “theirs” into, but from git’s perspective in a rebase it’s actually the opposite. This is really important to get a grip on and can help you resolve conflicts much more quickly. If you’re still confused, let’s look at an example. Say I have been doing work on a feature branch and I want to merge in the changes my teammates have made on the master branch. I’ve made 2 commits locally that aren’t shared on the origin remote, and while I’ve been working on my feature branch my co-workers have made 20 commits on origin/master that I don’t have on my branch (but I would like to). My log looks something like this on the local branch. My two recent (unshared) commits are at the top of the history, and the rest is the history of master when I originally checked out this branch. It forces the creation of a merge commit. This is useful information if there was a conflict, but otherwise it’s just noise which pollutes the history. Not good if you update your branch frequently (which you probably should). It buries my commits under an avalanche of commits from other places, when really they should be at the top of the log due to the fact that they’re “more recent to try and move upstream”. That is, it makes more sense for my buddy who is also working on this feature branch to see my commits first when he pulls in changes than it does for him to see the master changes. The things that I’ve been working on in this branch are probably more relevant to him. So what to do? Well, as you may have predicted, git rebase comes to our rescue here. git rebase origin/master will merge in the requested branch (origin/master in this case) and apply the commits that you have made locally to the top of the history without creating a merge commit (assuming there were no conflicts). Now our history is nice and clean, and we have avoided the two issues listed above. So why are people afraid? Previous experiences with loss of work due to a botched interactive rebase and/or force push (more on this in a second). If you frequently commit your ongoing work (which you should) and rebase, the probability of having unmanageable merge conflicts goes way down. If you run into conflicts while rebasing, fix them, and git rebase --continue, the rebase will continue to go off without a hitch (there will be a merge commit, but once again it will contain useful information about where the conflict was and how it was resolved). If the conflicts are too bad and you need to bail out and attempt a normal fast-forward merge, you can easily do so with git rebase --abort (leaving you where you were before attempting the rebase). So, always try rebase first, and your git history will thank you (and take note, there is git pull --rebase as well- I won’t go into the whole fetch/merge vs. pull flamewar here). Not to mention that interactive rebase is fantastically useful. I commit some stuff on one branch, the correct place for it, then have to move over to another branch to do some different work there. You quickly commit some changes e.g. a panic-mode bug fix. Oh, crap. I forgot to switch to master or the appropriate parent branch before checking out the new branch for the hotfix, and now I have the commits from the branch I was working on before, when really I wanted a “clean slate” from master. These other commits don’t belong on this branch. What to do? Now, obviously it’d be easiest to just not make mistakes in the first place, but I’m willing to bet that this sort of thing happens to people more likely than most of us would like to admit. So, we need a way to quickly deal with situations like this when they happen. What to do? You can’t just git reset --hard without losing your desired commit, and the git reset --soft song and dance is annoying. Fortunately, you can just do something like git rebase -i HEAD~2 to quickly drop the commits from your new branch. Just delete the lines for the commit(s) in the interactive rebase prompt. Obviously care should be taken that you don’t remove anything that’s not on other branches (thereby destroying work), but this is a nice swift way to correct the classic “these-commits-shouldn’t-be-on-this-branch” mistake. Sometimes, in order to save your progress as you go, you may find yourself committing disparate pieces which may be better served or represented as only one commit. For instance, your team might have a policy that all commits to a class must also have accompanying changes to unit tests in the same commit, but you like to check in your work as you go. git rebase -i makes combining these several commits into one a piece of cake. Just run git rebase -i HEAD~n, where n is the number of commits you need access to, and change “pick” on those commits’ lines to “squash”. Commits with “squash” on consecutive lines will be combined into one! Once again, rebasing helps us keep our history tight and readable. Some open source projects, such as docker, require contributors to sign their work using git commit -s (or a custom message) as proof of ownership. Changes won’t be merged upstream unless they are signed off correctly in this manner. So if you submit a pull request with four or five commits without know to do this, are you hosed? Will you have to do the git reset --soft song and dance and try again on a new branch? Hell no! You can use git rebase -i to rapidly sign all of your commits the correct way. Just change pick to edit for the commits in question, and do a git commit --amend -s (no need to change the original message!) 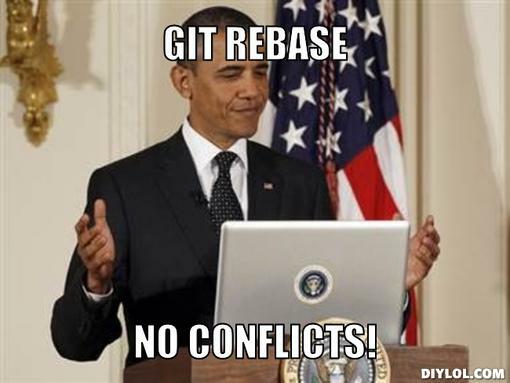 and git rebase --continue for each commit. This can be sped up with rebase’s exec option (git rebase -i --exec "git commit --amend -s --no-edit"). If I recall correctly, you can also do reword if you set up signing the commits automatically as a hook in your repo (this has the additional bonus of keeping you from forgetting in the future too). Now you can force push (git push -f) to the branch on the remote you’re making the PR from and the commits will be signed correctly. If you’re sitting there cringing because you feel force pushing is dirty, I agree. It is dirty. That’s why it’s so awesome. You are 100% sure you know what you are doing. You get explicit consent to do so from everyone working on that remote. Being loose and careless about this will get you a very bad reputation, and if you do it the consequences could range from getting kicked off the team to getting fired to getting hellbanned from touching a computer for the rest of your life. 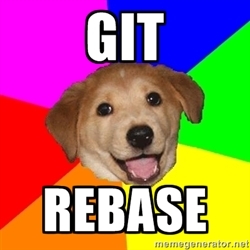 As long as you’re cautious, git rebase will be a blast. Learn it, love it, and grow old with it (until something better comes along!). As you’ve seen, uses for rebase run the gamut from “keep the history clean” to “holy crap that solves problems in a different way than I would have thought of before”. Until next time, stay sassy Internet.